Mansol Preforms manufacture glass and ceramic insulators, which are pressed into a range of shapes and sizes, dependent on customer requirements. The majority are circular with multiple holes, precisely located. They provide a crucial role in the performance of safety critical connectors, insulating each pin and providing an accurate location when male and female interconnect. They serve a variety of applications, such as military and automotive and in industries such as aerospace where a perfect hermetic seal and reliability is paramount. It is critical that the glass or ceramic insulator is manufactured to the precise dimensions needed and that the preforms are measured to ensure that the position of the holes and their relationship to the outer diameter are accurate. Customers in these regulated industries require comprehensive measurement reports, ensuring that the dimensions are compliant and within permissible limits. 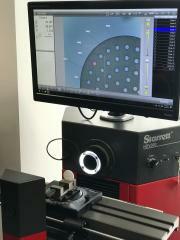 Mansol Preforms came to Optimax Imaging and Inspection with these requirements, who after consultation and technical qualification, recommended the Starrett HDV300. The HDV is robust, at home on the shop floor, but also advanced enough to outperform tradition technology in the measurement room. Configured like a horizontal profile projector, but fully digitized, with a high-resolution sensor and LED surface and profile lighting. The familiar user-friendly format, is flexible, ensuring that it can be used both manually for single and low volume quick checks, or programmed and automated, providing significant time savings and improved reporting outputs. In place of the traditional paper overlays, digital CAD files can be imported off the network, providing immediate Actual/CAD data overlay and real time comparative measurement. 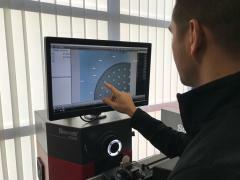 Parts can also be programmed into a library and the touch screen software will recognise the pattern of the part and measure the position of the holes automatically. For regularly manufactured parts this provides a huge time saving over manual measurement. It is also very easy to switch in the program library, from one part to another, it will even pattern recognise, matching the shape to a previously recorded sequence of measurements. The professional reporting outputs allow templates to be easily created, exported and sent to customers, saving time and ensuring accuracy in the manufacturing process. The direct CSV excel interface is also standard, as is SPC. The equipment is UKAS calibrated by Optimax, ensuring that it conforms to an internationally recognised standard, providing an independently audited process of verification and well understood measurement uncertainty. Adam Kimber, Managing Director of Mansol Preforms commented “We are delighted with the new HDV300 and the measurement flexibility that it provides us. The library of parts that we have been able to program has already saved us significant time and we expect this to increase going forward. The library combined with the ease and quality of reporting, has delivered a real return on investment for the company”.